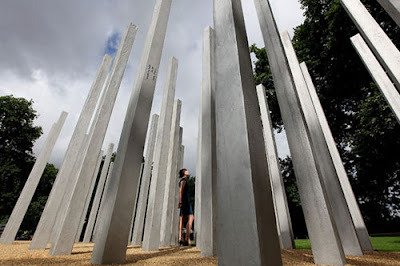 The 7/7 Memorial was unveiled today in Hyde Park in London's West End, on the 4th Anniversary of the tragedy. 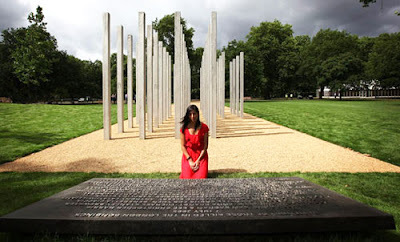 The memorial consists of 52 stainless steel pillars, or 'stellae', one for each victim. Each one is 3 metres high, and they are grouped in four clusters, to mark the four locations of the attacks - Tavistock Square, Edgware Road, King's Cross and Aldgate. There is also a 1.4 tonne stainless steel plaque with the names of all those who were killed, engraved in a very clean sans typeface. This week's Creative Review blog features an informative analysis of the typography. Despite the modernity of the lines and the materials, it strikes me how much the memorial resembles a complex of bronze-age standing stones, giving it a very pagan, brooding power. When the architects, Carmody & Groarke, were interviewed on the BBC, they talked about their collaboration with Andrew Gormley, and their close consultation with the families of the victims, but there was no mention of this visual connection. Strangely, in other various reviews I've read, no-one has yet alluded to it. Judge, and interpret, for yourself. In Pictures 7/7 Pillar Memorial.